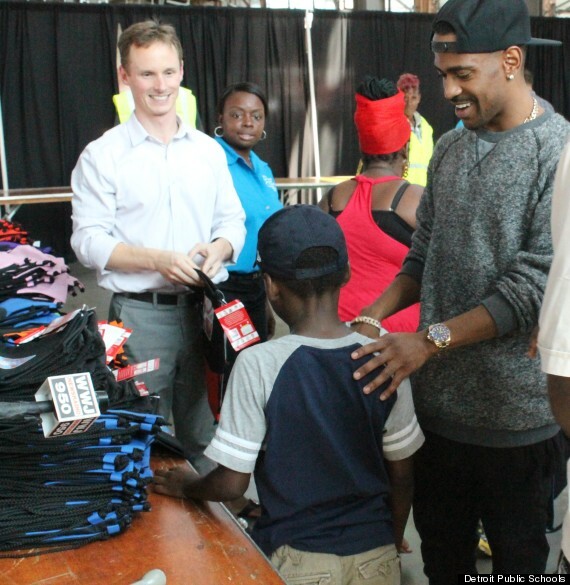 Rapper Big Sean took time out from promoting his new album, “Hall of Fame” and dropped in on a back-to-school fair held in his native Detroit. The Kanye West protege handed out backpacks filled with school supplies donated by Office Max. The fair included educational games, career guidance and much needed school supplies for public school kids–an ever-present need this school year–and some love from one of the hottest rappers in the game. “The Huffington Post” reported Big Sean offered hugs, handshakes and encouraging words along with those pencils and notebooks to families there. A product of the Detroit public school system, the rapper says he had an urge to give back, and he’s attempting to with his new venture: Sean Anderson Foundation. The foundation promotes “education, health and well-being” of Detroit youth. So, it’s not a stretch that the back-to-school fair would be the foundation’s first project. After hearing this inspirational tale on “NBC Nightly News” this past month, I couldn’t pass up a mention. 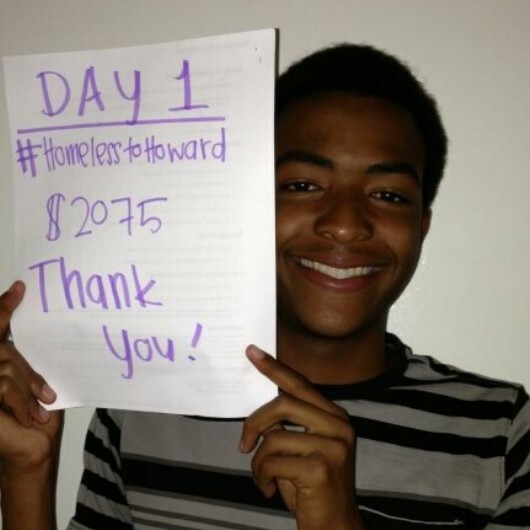 James Ward went from living in a shelter overlooking LA’s skid row with his mom and two siblings to entering the Black man’s Harvard aka Howard University as an incoming freshman, and who paid the tab? YOU. 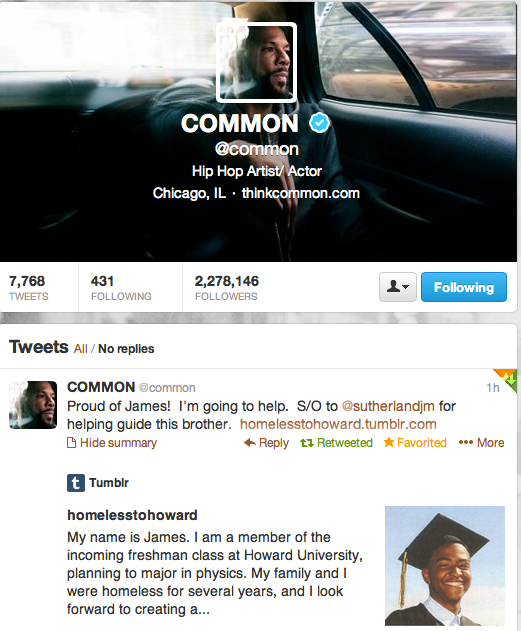 That’s right, all those kind generous souls who went on James’ Homeless to Howard fundraising site, which rapper Common was so kind to share with his Twitter followers and contribute to the cause ( smart and generous *swoon*) is what landed the 19-year-old first-in-his-family-to-attend college on a higher learning plateau. 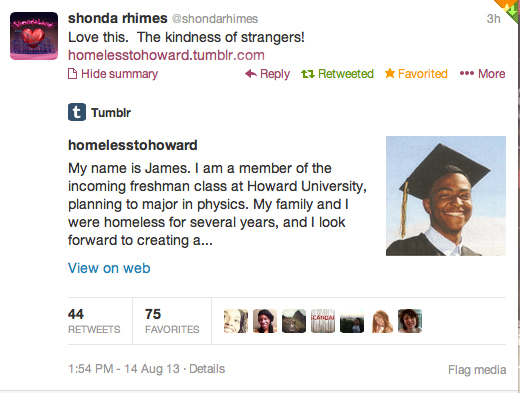 Brainchild to ABC’s Scandal and Grey’s Anatomy Shonda Rhimes also showed James some love for his cause. How do you thank complete strangers for paying for two years of schooling? (FYI…one year at Howard cost over $32 Gs.) The above photo is great start. But James’ plan is little bigger. He is launching a non profit to help other young kids get a fair shake at a quality education. What a great way to pay it forward.